*When I arrived home from work, I loved that it was still so light outside. 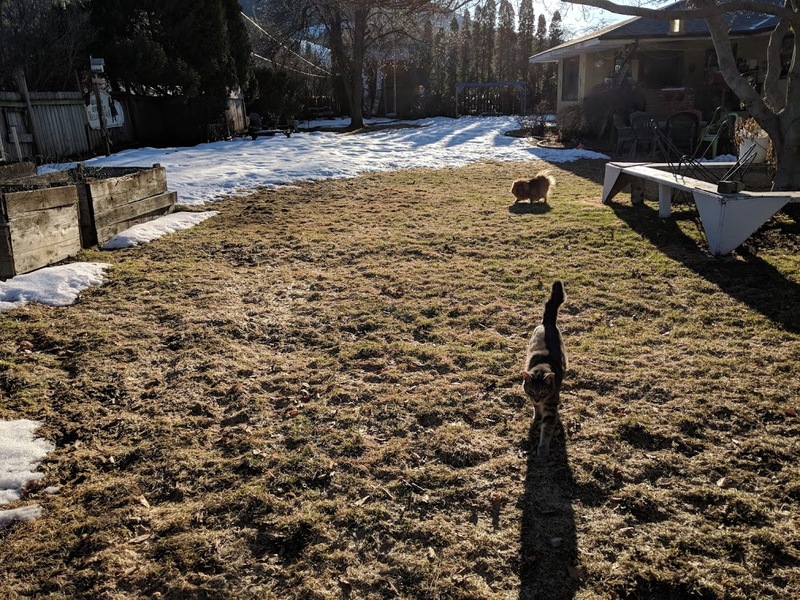 I went out in the backyard with Mr. Clark and Sadie, and marveled at where the backyard had no snow, and where it still had a couple of inches. A few more days of sunshine, and the forecasted rain, and it may just go away. It is official. I am ready for spring!! *Students attending North Idaho College next fall have some deadlines coming up, so I sent notes to them today to help keep them on track. A lot of student are being chosen for Financial Aid verification through the various colleges they will be attending, and sometimes parents and students need a little assistance in filling out those papers and completing the steps required. Because if they don’t, they will not receive any financial aid monies. *Paul is bravely teaching students how to drive again this spring by instructing Driver’s Education. He normally just does the driving part, but last Thursday, Friday and this morning, he also got to teach the 7-8 a.m. classroom instruction part while the other teacher was out of town. I think he will enjoy getting an extra hour of sleep tomorrow morning, since he won’t have to be at KHS so early. *I have two senior girls who often come and hang out in my office during seventh period a few times a week. I enjoy listening to them talk about their lives, and am often intrigued what goes on in their lives. I enjoy them being around and they bring fun and life into the office at the end of the day. *Since we don’t go down to the basement a lot, we still had Christmas decorations up. Molly, Travis and Cosette are arriving tomorrow to spend a few days home over their spring break, so I decided it was time to take down Christmas in the basement. Paul helped me take the ornaments off the three little trees, Paul dismantled the trees and stored them, I stored the ornaments, and also put the Nativity Scene away, and a few other odds and ends. Mission accomplished!! *I have been enjoying looking through my Alexis App in my phone, pulling up TuneIn, and going through the many options of podcasts to listen to while I work in the kitchen. Tonight I listened to a BBC news station for a little bit, then I found a great interview with Jennifer Egan, the author of the book I just read, Manhattan Beach. She talked about how she wrote this book and it was really interesting. I sent a link of the interview from the program New York Time--Book Review to the members of my Book Club. If you would like to check out this podcast, you can go here. *Another podcast I have been listening to in the evening is one called Uncivil. Bill and Debbie had told me about this one. It is a history podcast, where they go back to the Civil War, and bring stories that were left out of the official history. If you want to check it out go here. *I also worked on my new knitting project for a while, and am making progress on it. I LOVE the yarn I purchased last Saturday to make this project. And Debbie’s guidance on Sunday has really helped make the process easier.